We arrived early – about 40 minutes, although, as we had a medical emergency during the night, we were aiming to arrive much earlier. Welcome to Charleston. It is 9am and it is 31 degrees in the shade and is set to go up during the day. Yikes. The walk into the terminal involved descending two storeys via a three-slope zigzag airbridge. This is tricky downwards – upwards will be nigh on possible, so we’ll have to get a chair to get mum back up it later. So we went ashore and walked into the town centre, which was one block away. The heat from the sun was merciless. It pounded down on us and there was very little shade to be found. And the humidity was insane. We browsed the old market, which is a covered market, thank goodness, which dates back to the earliest days of Charleston, and I bought a few bits and pieces. Then we went to find the restaurant that had been recommended in Tripadvisor. Big mistake. Huge. Toast is the number one rated restaurant in Charleston (out of 500) on Tripadvisor with glowing reviews. Well, here’s mine. Brace yourself, it is, indeed, glowing. If you must go to Toast, book ahead. Otherwise you will be made to WAIT while those that have booked go past you. After far too long, 15 to 20 minutes, you will be offered a table only when you threaten to walk out, and then they will try to park you by the loos. Oh no you don’t! The menu is varied and interesting, but don’t believe a word of it. 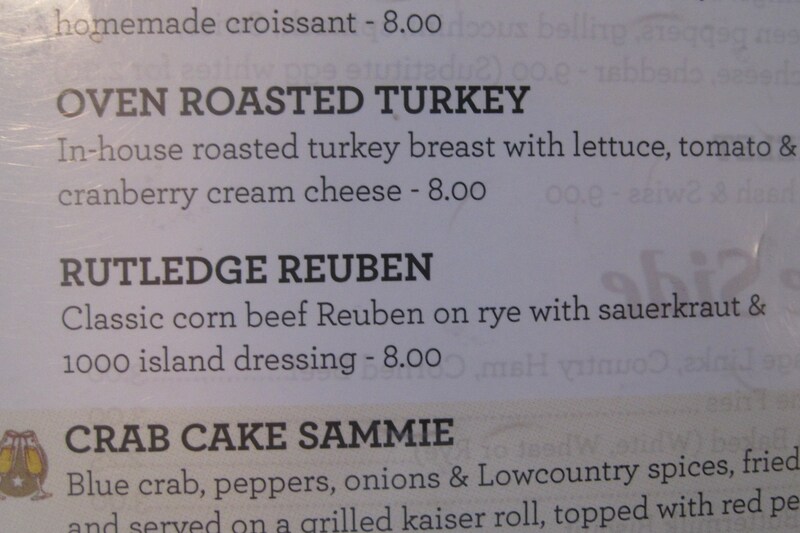 Just because their specialist dish, the Rutledge Reuben, is stated to contain beef on rye with sauerkraut and 1000 island dressing, don’t assume a thing. Reubens often contain cheese, but this is their own version of it, so it’ll be a bit different and contain what it states, right? Wrong. What will arrive will be beef AND CHEESE on rye. Here’s the menu. Do you see any mention of cheese? No, neither do I. So while I ate my chicken strips, mum and dad had to WAIT EVEN LONGER for fresh ones to be made with the contents as specified. By the time they got their food, I’d finished. In fact, I paid the bill and went to the loo to pass the time while they ate. The food was nice enough, by the way, but it nowhere near deserves its status as number one in Charleston. Not even close. My drink didn’t even include a refill! And the loos are appalling. Although clean and properly provisioned (paper, soap, hand towels) there is only one and the lock doesn’t work. Mum walked in while I was on the loo! I had locked it, I swear I had, but if someone as feeble as my mum purports to be can force their way in, it’s not much of a lock. I think the main problem I had with the place was the attitude. Sort of patronising but laid back and a bit too carefree for working in a busy restaurant. I get that this is the South, but we only have seven hours to see this entire town and wasting over an hour and a half of it waiting for you to get your act together is simply not on. We even told them we were in a hurry, we even told them why, but they couldn’t have cared less, and one of them is particularly good at dumb insolence crossed with patronising, purveyed in such a way that you can’t tell for sure whether she is taking the mick or not, so you can’t complain. And then they swindled me on the t-shirt, which I shall be sending back. 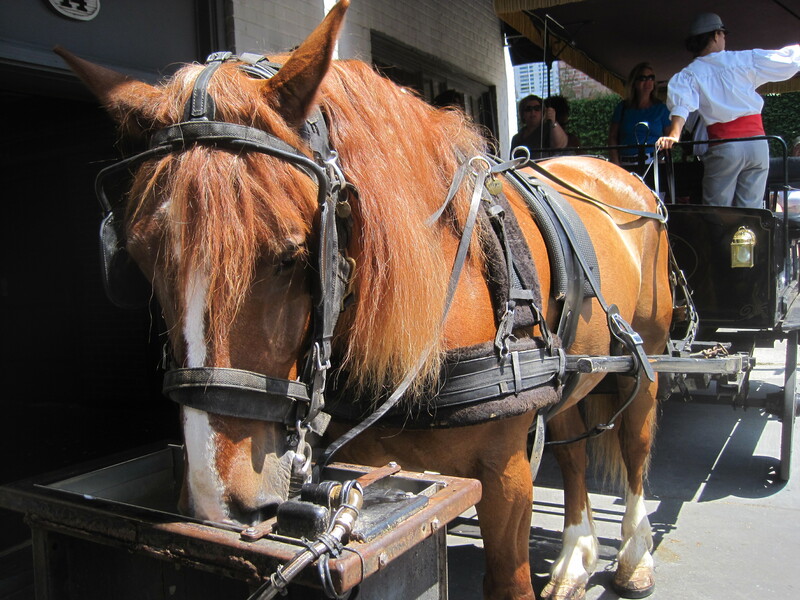 One of the marginally more competent waitresses recommended the horse-drawn carriage tour, as the guides are professionally trained, so we walked back to where they were and booked onto one. Then we… go on guess. Yes, we WAITED. Over half an hour. Seriously, all you do in Charleston is WAIT. 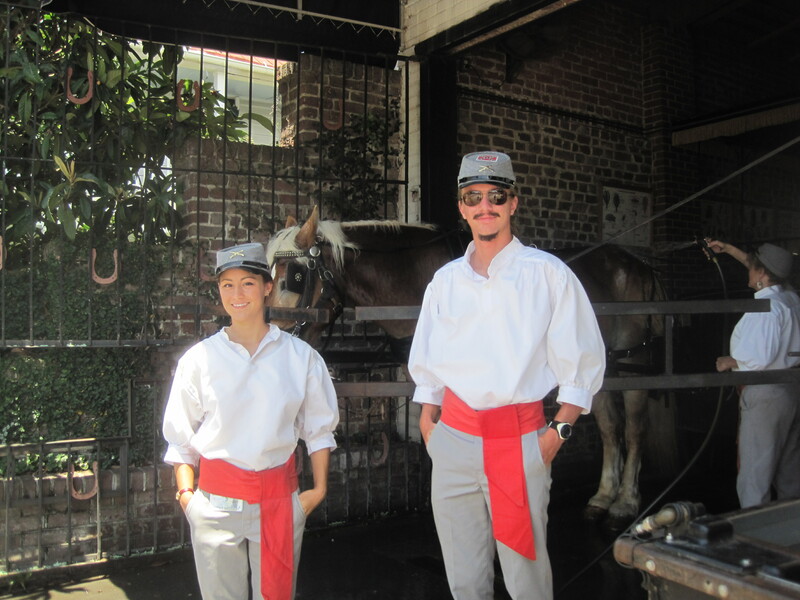 Turned out our horse was overheated, despite the fact that every stall had a fan and every fan pointed at a horse, not the humans – they even hosed him down a couple of times, but to no avail – so they had to change them over. We ended up with the best behaved one, Earl, which was nice. This is Earl. Our guide, Daryn (female), was very good and we were shown around some of the oldest houses in Charleston and she told us about the history of the place, including the civil war (obviously – the first shot was fired here), a massive earthquake, including liquification (where the earth ripples – sounds horrible) and the great fire that burned down over 500 buildings, one year into the civil war. Talking of which, the tour guides all wear full Confederate uniforms, although without the jackets (well, it is over 90 in the shade…). In fact, Daryn told us that if the temperature rises above 96 degrees, the entire town shuts down, and if the horses’ individual body temperatures go above 103, they get the rest of the day off. All in all, a very interesting hour-long tour, although whether it was value for money at TWENTY-ONE dollars a head, I’m not sure. Although, bearing in mind that if you booked it through the ship, it cost exactly double that, we didn’t do too badly. When we got back, I bought an apple-flavoured sorbet called a Charleston Ice (yummy!) and we caught two cycle cabs to Waterfront Park, where we sat and had a drink and listened to the children shriek as they ran through the fountain (which was, interestingly, chlorinated). Then we walked back to the ship. We thought we could hop on the free trolley bus, but it turns out the stop marked on the map doesn’t exist. Ahem. So, in summary, Charleston is pleasant enough, but take a brolly and a fan – the heat and humidity are murder – and don’t go to Charleston if you’re in a hurry. Ever. For anything. You will queue for everything you see and do and they are in no hurry at all. Normally, I’m a big fan of the take it easy attitude, no hurry, whatever, I am on holiday, after all, but when I’m trying to see an entire town in one day, a modicum of haste would be appreciated, particularly once I’ve TOLD you I’m in a hurry. Eat Charleston Ice. Do NOT eat at Toast. That is all. Herewith the restaurant review as it will be submitted to Tripadvisor. Enjoy. PATRONISED, INSULTED, MISLED, WRONG ORDER, TERRIFIED AND THEN SWINDLED. IN THAT ORDER. DO NOT EAT HERE. EVER. Worst decision of my entire life, to eat at Toast. There was one couple to be seated before us. We waited over 20 minutes while they seated everyone else who came in. They gave my mum a seat and then patronised her when she complained about the interminable wait. FINALLY they seated us. We ordered two of their “Rutledge Reubens” and some chicken. Then we WAITED. For AGES. When the Reubens came, they had cheese in. There was no mention of cheese on the menu. If you put cheese on your reubens, PUT CHEESE ON THE MENU. It is a SIN for Jewish people to eat cheese and meat together and my mother felt quite sick. So then we WAITED while they made fresh ones. Which took EVEN LONGER than the first ones. By which time, I had finished my food and drink, which was not refilled. I went to the toilet – there is only one – and either the lock doesn’t work or my mother is strong enough to break the door down, because she was able to walk in on me. For some reason, I decided I would by a t-shirt. When I got home, not only did it STINK, but it was NOT “the same as the ones the servers were wearing” but had some slogan and a really ugly picture on it which I would not be seen dead wearing and which will be returned in the mail as soon as I get home. Don’t eat at Toast. EVER. It was the worst service in the worst restaurant I have ever been in, and the food, when it finally arrived, was adequate at best. Shame on you, Tripadvisor contributors, you let us down, and shame on Toast for the worst meal of our lives. Never again. Our carriage ride was very exciting. The horse bolted and the back wheel fell off – I jumped off followed shortly by David. It was scary.